Both of these French words signify a design made with wooden pieces on a flat surface, but the difference is that Parquet is typically used for wood flooring, and Marquetry is normally to be found on furniture. Differing species of top-quality wood with contrasting colours, tones and grains are cut into various shapes and used for decorative effect on Parquet flooring in a repeating geometric style of mosaic patterns. 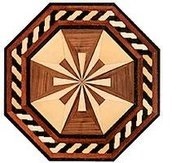 Apart from the use of wood, Marquetry (or"inlaid work") can be made from many different thin sheets of material and these pieces of veneer are laid down in the form of intricate imagery - usually on the smooth surface of furniture. The traditional method of knife-cutting the veneer was superceded by scroll or fret saw techniques in modern times and computerised laser cutting has now been adopted by manufacturers supplying the mass market. 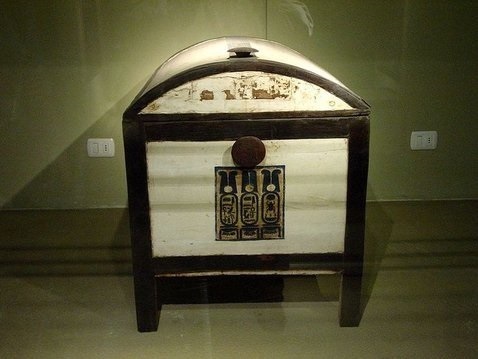 Marquetry can be traced back to the ancient Egyptians as can be seen on many items made by them, including the side of a chest (JE 61461) discovered in the tomb of Tutankhamun (see below). Mosaic flooring has also been found in archaeological sites throughout North Africa, but it was the Romans who discovered that roads became more stable when their oblong bricks were laid in the same direction as the traffic. They used the basic herringbone pattern which also became a popular choice during the middle-ages for domestic Parquet floors made from wooden blocks. Although there are many templates available, the Herringbone design remains the most popular pattern to this day. Marquetry as we now know it started during the 16th century and evolved from the Florentine techniques of inlaying semi-precious stones on marble slabs into intricate patterns in Naples and Florence. Wooden marquetry was developed by cabinet makers in Flemish centres of luxury such as Antwerp, and the beautiful furniture produced by these craftsmen decorated many royal residences throughout neighbouring France. Its popularity was so great in this part of the world that it eventually became known as French Marquetry with mainly floral designs arranged in intricate patterns using a combination of pewter, mother of pearl, tortoiseshell, brass, ivory and bone etc. Imaginative techniques and simple tools allow masters of the arts and crafts to produce decorative effects which can literally turn a blank piece of furniture or wooden floor into a work of art. The Floorfixer floor restoration team have a passion for old wooden floors in general and take particular pride in restoring beautiful parquet floors to their former glory. The beauty of wood speaks for itself, but Marquetry and Parquetry are both artistic decorative forms of woodworking which are appreciated by many people right up to the present day.